Unaffiliated Norwalk Mayoral candidate Lisa Brinton speaks to supporters, Wednesday in BanC House, a restaurant on River Street. The election is Nov. 5. Correction, 5:51 p.m.: Toni Williams was born in Mississippi. 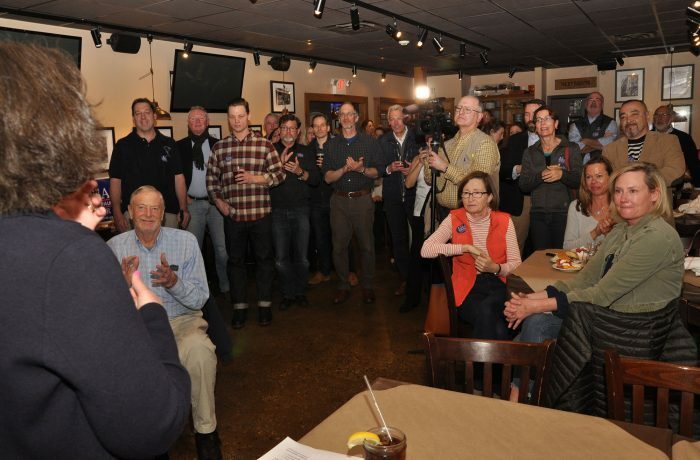 NORWALK, Conn. – Mayor Harry Rilling’s only challenger to date drew support from up to 40 people Wednesday in an early-season campaign launch at BJ Ryan’s BanC House, in Norwalk Center. Brinton ran for Mayor in 2017 in a four-way race against Rilling, the Democratic incumbent, and got more votes than Republican candidate Andy Conroy. She has been seeking the Republican nomination but hasn’t spoken to the Republican Town Committee since January, she said. The crowd featured a mix of Republicans, including Ernie DesRochers, Josh Jewett, Charles Yost and Patrick Cooper, as well as Democrats and unaffiliated voters. RTC Chairman Mark Suda was not present. Republican Board of Education member Bryan Meek is Brinton’s campaign treasurer. It’s “hard to tell” if Norwalk Republicans will endorse Brinton, former Council member Rich Bonenfant, a Republican, said. Brinton on Wednesday said she’d steer Norwalk in a nonpartisan fashion toward its brightest and best future. She came to Norwalk 20 years ago and became an education activist after retiring early to focus on her sons, spending six years on the school data management team, she said. She became interested in Zoning five years ago due to an issue in her neighborhood. “The Mayor campaigned six years ago on these issues and at that time, I supported him. But sadly, things have only gotten worse,” she said. Issues of concern she cited include contractor yards in South Norwalk, an “over capacity prison in a family neighborhood” on Quintard Avenue, and the need to protect the shellfish industry from the construction of a new railroad bridge over the Norwalk River. Lisa Brinton supporters listen to her speech, Wednesday in Norwalk Center. “My plan would not include paying for the IMAX Theater three times over with public money or tearing down the Garden Cinema because we won’t hold a bank responsible for poor lending, or admit city responsibility for a bad development,” she said. The Connecticut Department of Transportation, as part of the aforementioned Walk Bridge project, is funding the replacement of the Maritime Aquarium’s IMAX Theater; in a separate issue, the City is negotiating with Citibank to restart the stalled Wall Street Place development (known to many as “POKO”) and the proposed deal may involve developer JHM Group buying the Garden Cinemas and tearing it down so that the property can be used for parking. Brinton mentioned “millions spent on legal fees, frivolous lawsuits and settlements” that would be “better spent improving residential quality of life, the schools, or helping small business,” and criticized the reorganization of top-City staff, passed this year by the Common Council. “My administration would look for staff, commission and Board members with expertise in commercial property, land valuations, risk assessment and project management. Why? Because land funds 90 percent of our city. We must do better. In my administration, land use will cease to be a political game where the few pick winners and losers,” she said. “This means a leader who supportive of small business and a sense of community rather than more fortress apartments,” she said, drawing applause. Brinton’s last campaign featured many comments about the high percentage of Rilling campaign donations that came from developers. Former Democratic Mayoral candidate Matt Miklave, left, chats with ConnCAN Statewide Outreach and Advocacy Manager Toni Williams, Wednesday in BanC House. Among her supporters was former Common Council member Matt Miklave, a Democrat who was part of a four-way Democratic Mayoral primary with Rilling in 2013. “I think Lisa has a lot of courage, a lot of political courage, and I admire that. I am looking for a candidate with vision, who can take our city in a better direction,” Miklave said. It is indeed early for a campaign launch, Miklave said. Brinton announced her candidacy in December, which is unheard of. “It’s not a sprint, it’s a long race,” Miklave said. Brinton has never served in City government as an elected or appointed official. “I think some of the people who have held the office have proven you don’t need a ton of experience to be Mayor of the City of Norwalk,” Miklave said. Rilling is former Norwalk Police Chief, who served on the Zoning Commission before running for Mayor. Norwalk needs a Mayor “who is a proper CEO-type person,” David Mapley said. Mapley has a Facebook page, Norwalk Taxes Too High, and complained about the state of Bayne Street sidewalks. He spent the last four months in Europe and would like to retire and live here year-round, but he might need a job just to pay his property taxes, he said. Norwalk Community Soccer Club President George Caceres said he believes that Brinton is really going to improve Norwalk. Caceres said he was a registered Republican until former Council member Warren Pena talked him into becoming a Democrat. He’s returning to the Republican Party because “it’s useless to be a Democrat,” he said. 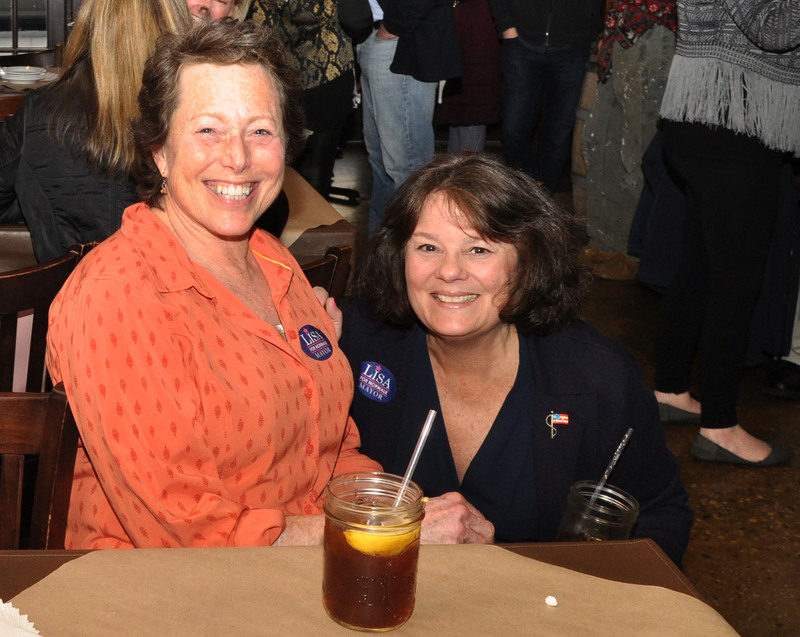 From left, Marjorie Neaderland and unaffiliated Norwalk Mayoral candidate Lisa Brinton. Brinton would have to get on the ballot as a petitioning candidate if she doesn’t win a Republican endorsement. If she were endorsed by a registered third party, Republicans could cross-endorse her, but she cannot be endorsed by Republicans as a petitioning candidate. The deadline for becoming a petitioning candidate is Aug. 7. ConnCAN Statewide Outreach and Advocacy Manager Toni Williams, who no longer lives in Norwalk, attended the event. “I participated in women’s campaign school at Yale. One of the rules of Campaign 101 is if you run and you don’t win, don’t take it to your head, and go again. 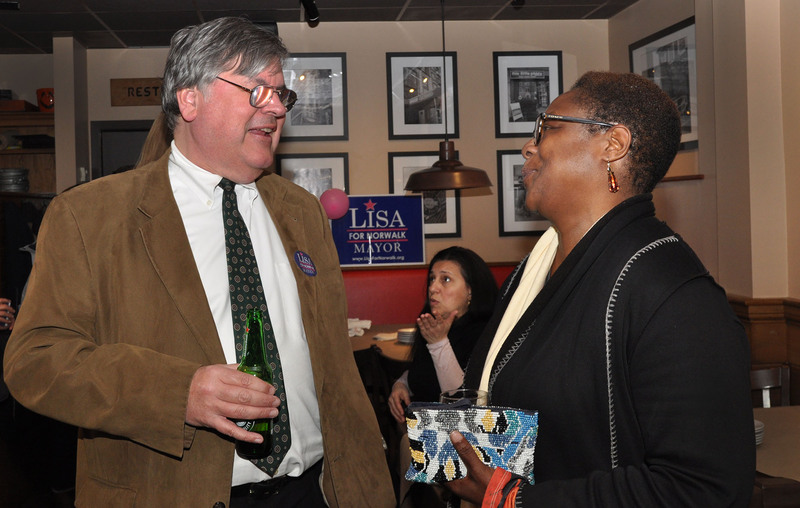 I am very proud and grateful that Lisa as a woman is choosing to make her campaign happen,” Williams said. Williams’s family moved to Norwalk when she was 7; she has a ConnCAN office on North Main St., and has many friends and family here, she said. Pat Amundo said she is a registered Democrat who worked on Brinton’s campaign two years ago and will be more active in City politics this year. Rilling announced in January that he’d be seeking a fourth two-year term. He won the 2017 election with 56 percent of the vote; Brinton came in second with 22.4 percent, and Conroy came in third with 15.2 percent. Petitioning Democratic candidate Bruce Morris took 6.3 percent. When I read that Lisa was having a rally to launch her 2nd Mayoral campaign I decided to check out her website. Unfortunately it was just a few bullet point without any substance and without and information how she was going to accomplish those few things and make positive change for Norwalk. I also have concerns as she cannot seem to make up her mind on issues and stick with it. In her last run as Mayor Lisa Brinton talked and talked about a city manager form of government. This time around not a word of that. Maybe she changed her mind? Last time around she was all about being an independent and not owing to any party. Then she became a Republican and then back to an independent when she decided to run for Mayor and didn’t want the Trump backlash. Lisa stated when challenged about her time as a Republican that she was also a Democrat at several points. Maybe she changed her mind a few more times? I hear that now as an independent she has big time Republican as her finance director for her campaign. I also have heard that she will be endorsed by the Republican Party this time around. I guess so much for not owing to a party. Maybe she once again just changed her mind. Where does she stand on Norwalk being a sanctuary city? Some 60% of City residents are homeowners facing ever higher punitive property taxes, falling property values, exodus of long time residents and influx of renters (40% up from 30%). Who represents them ? Who represents City residents demanding Professional Management at City Hall, e.g. using Prof. Search to secure Top Talent rather than “soft search”, demanding City Dept Heads reduce budgets, awarding merit increases for reducing budgets not merely always spending more and creating a City Hall team taht attracts new business investment, not one that rejects business. Who represents City residents demanding an accounting of the huge costs associated with the Mayor’s Walk Bridge for a project that brings no benefit at all to the City. Just years of disruption of our Downtown. Who represents City residents who demand an attractive, business and people friendly Downtown after decades of neglect ? Who represents City residents upset that accoding to FBI Uniform Crime Reports Norwalk has more violent crime per capita than either Stamford or Danbury ? What does Lisa think of the over crowding due to thoughtless over building with massive apartment buildings everywhere in our once beautiful city. Now we look forward to congestion, traffic, no open space, no open skyline, more illegal apartments, and a city that has been transformed into something I do not like at all. Due to stagnant and falling house prices I am stuck here for now watching the city continue to go into a downward spiral. It sure is not the Norwalk that I bought into 35 years ago and lived for the past 60 years. 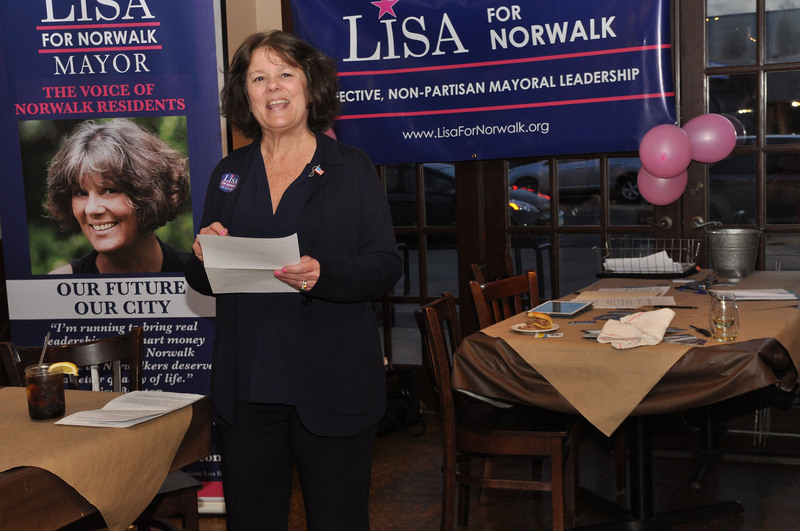 I believe we need change and third party is the way to go but when Lisa says, “This campaign is called Lisa for Norwalk because I will represent the people of Norwalk, not party or special interests. As an independent candidate, born from a bipartisan, grassroots movement, I believe we can steer a better course,” and then it’s stated later she is a potential candidate for the republicans how can she truly be bipartisan? Ron Morris- wasn’t Harry Rilling against the Mall when he ran originally and then flip flopped to say he was for it? How to you reconcile that? wish I had known about your event,would have been there. glad to support you and your vision,we must change and get rid of the good old boys group running this city. @cc-rider… You are correct. I was at a meeting where he mentioned that he flip-flopped to a group of us. I was flabbergasted and could not believe his nonchalance regarding such a massive project which would have so many repercussions and hurt quality of life for residents. A discussion ensued, and when Mayor Rilling was pressed as to why the flip-flop, he answered simply that he thought it would be a better use of the land for the residents to look at than an industrial or other type of use for the site. When pressed with questions like, how would you know that residents would prefer the mall over a different land use if you didn’t bother to ask the residents for their feedback, maybe a more appropriately scaled to the locale, open air mall shopping experience with some green space and encouragement of foot traffic is what the residents wanted to maintain nautical village charm, what is Plan B if the mall is too big to be economically sustainable in the long run, why such a humongous, disproportionate structure for that setting, what kind of traffic/environmental issues will it generate, where is the traffic study of surrounding areas to learn how it would exacerbate already bad traffic conditions, etc. Lots of intelligent, pertinent questions were asked. He couldn’t answer one question. Stakeholders, please consider voting for Lisa before Mayor Rilling and his closed session administration destroy every little bit of unique character in our city! Mayor Rilling just doesn’t get it! Let’s take Norwalk back and give stakeholders the voice they deserve! Ultimately, it’s the voters who are responsible for the mess we find ourselves in. If they held their elected representatives’ feet to the fire and demanded accountability from them, the landscape would be vastly different. When 30-40% of eligible voters vote and tote the party line, you get what we have now, unlimited cronyism, unqualified persons being paid huge salaries with no oversight, and taxes being raised and flushed down rabbit holes. If the two “political parties” which we have in Norwalk, would put up qualified candidates for the offices, you wouldn’t have a council of 14 to 1 running things. Wake up Norwalk. Soon you won’t be able to afford to live here and this town which has had such a long history and culture will be abandoned to the developers who have these so-called politicians in their pockets. Norwalk should have a 2-term limit for the Mayor. “Norwalk needs a Mayor “who is a proper CEO-type person,” David Mapley said. Dave, do you even know what a CEO does? Good grief, as Chief of Police, Rilling was the CEO of the police force! Which meant he oversaw the budget for the PD, negotiated union/purchasing contracts and managed a large admin staff and force. Has Lisa ever managed anyone? Has she ever put together a budget as large and complex as a City government one? Does she have CEO experience that you thing we need? Has she ever negotiated government contracts, or dealt with Union contracts? As far as I know she doesn’t, her only work experience was in the Corporate world well over 10 yrs. ago. Now she supposedly consults. At what I have no clue. The comments about parks are not true. Mayor Rilling is a supporter of athletic fields. Nathan Hale – got the lights, now will get bathrooms… He is moving the West Rocks field further and it will become an amazing center for kids to play sports. He is approving the design of Broad River for fields and he is supporting a new softball field for the girls in Norwalk. He has added all of these items into the budget. He has supported playgrounds for the various schools. He has figured out a way to do all of this while supporting one of the biggest movement in the city for Schools and Education. It is not okay to make statements that are just not true. He has listened to parents about the importance of fields for sports and has moved these initiatives forward. The world we live in. An individual professes a non-partisan approach to city management, and the partisans lose their minds. And I thought we were the naysayers. I love a librarian who lectures about CEO’s. But is mostly concerned with union contracts. I love a fake name who plays the never-ending game of react to me – a surprising sense of entitlement from a person or thing that does not exist. Lisa – please, make it a personal discipline never to engage with or respond to fake names. Responding to Ronnie and the others is like debating Tinkerbell about Riemann’s Hypothesis. You must be nuts. Besides – they mostly reside here – you can’t post under a fake name in the Hour. Here we have a feisty, determined and personable women who combines the best mix of corporate training & experience with up-to-her-elbows history of local activism – who see’s and experiences first-hand how poorly managed this city is – and decides to run. To offer an alternative to the status quo. Party politics is anti-intellectual. It’s about tribalism, not the meritocracy of idea’s. There is no party-centric methodology to sound management. To my recollection, W. Edwards Deming’s “System of Profound Knowledge” doesn’t have one reference to a political party. By all appearances, and to read the commenter’s here – you could be misled into accepting that Norwalk is simply a 1-party town. But according to no less than Stuart Wells – the numbers tell a very different story. The largest number of voters (41.1%) in Norwalk identify as “unaffiliated” – greater than registered democrats. To those U’s – I say this: please participate. The D & R parties do not let you pick candidates. But they cannot prevent you from selecting a candidate who will represent you. Listen to Lisa without party prejudice, and you will recognize what other thoughtful D’s, R’s, U’s, Green & Working party members have acknowledged. Nancy botched the headline – we are not “fan’s” – we are supporters. This isn’t about personalities, it’s about professionalism. Lisa addresses the issues that are affecting Norwalk’s people, places, and processes. Like you, Lisa knows the current mayor driven crony “friends & family” approach isn’t working for Norwalk. Demonstrably, it’s not progressive, nor fiscally sound. Listen, learn, and then participate. I’m confident that if you do your research, and trust your eyes and feelings about the status of our city, you’ll come to appreciate the platform she stands on. I think if you look at your posting guidelines it seems Patrick Cooper is violating them by saying I have a fake name. If we are going to have rules they need to be for everyone. I posed facts that clearly Patrick Cooper doesn’t like. He posted attacks. Moderator replies: The policy prohibits making assertions about a commenter’s actual identity, i.e. stating that the person posting as John Smith is really Jack Jones. It’s suspicious that the state democrat’s phone system has been “out of order” for over a week. No direct lines. Just in time for them to jam tolls and legal dope down our throats. They just voted $140,000/yr state attorneys a $12,000 per year bonus. These guys also get 9 weeks paid vacation. $12,000 is like 2 months income for most of us. Democrats are driving this state into the ground. Proud to be a naysayer. So much to naysay about. The time has come for a Naysayer Mayer! Hi Patrick-I know that you assume that I’m a Librarian because you looked at my Facebook page and all you see as a lurker is that I work for the New Canaan Library. If you had gone to our website you would see that I’m the Finance Officer. As they say, If you cannot be an athlete than be an athletic supporter.
. The taxes collected being wasted on lawsuits and lawyers Is perverse. It’s time for change. @Pam – I don’t think he ever said you weren’t a Finance Officer, he just referred to you as a librarian in this instance. @PP , pat cooper presents very well formed positions. You have conflated viewing a web page as lurking. And you assume he didn’t visit the NCL website. @RayJ – whole hardily agreed with your point about waste driven by lawyers. It is an obvious albeit frequently used strategy – the more combative and aggressive – the greater the billable hours. Norwalk has way too many layers of lawyers – you can spot one when they use “to the extent” in a sentence. I’m certain when you add all the related legal salaries, benefits, bonuses, retainers, travel expenses, paralegals, paid consultants & witnesses, the total pile of money per annum would build a brand-new school – about every 3 years. As for the assumptions – I did neither (nor would I care to). The librarian presented herself as such two years ago. I simply remember. No odd couple. Memory is a remarkably resilient thing. Lisa: If you commit to abolishing the Redevelopment Agency I will resoundingly support you! Hear! Hear! RDA needs to be a bygone era. The agency holds too much behind closed doors power of decision making, which stunningly is consistently endorsed by the majority of our Common Council, and which is crushing the heart and soul of Norwalk, one neighborhood at a time. Mr. Sheehan is a one trick pony… Apartments, apartments, and more apartments, the most identifiable and iconic one of them all being POKO I, aka, “The Tyvek Temple”. Great taxpayer money and small business vampire we got there… always the subject of clandestine, closed session meetings. Why the secrecy? Where is the explanation for POKO I which the stakeholders have been promised since forever? Transparency, please?! Quick! Get RDA out of here before they sell out to more wealthy developers and gobble up more parcels which could have been used for businesses of INNOVATION and economic commerce and pack in more cheap to build, expensive to sustain (by taxpayers’ money long term… Attention Common Council members!!!) apartments w/o any ROI data attached to them to add to our sad collection! Lisa’s articulated plan to approach redevelopment in a more taxpayer sensitive, creative big picture vision way which preserves Norwalk’s quality of life and unique character and incorporates the input of the stakeholders is one of the many reasons she has my family’s votes. Go Lisa! You can do this… We believe in you! @Patrick, I find it funny that you think that by calling me The Librarian discredits me in some way. Apparently you don’t think too highly of Librarians, a noble profession, thus the use of it in a disparaging way. I scare you, don’t I.
It’s unfair to judge Pamela Parkington for being a libertarian. As long as she’s the good, Menger style libertarians and not one of those Hegelian style libertarians, I have no problem with her.